A nice versatile booster here by Bjorn, with switchable buffered or true bypass switching. I have kept the buffer separate so those who just intend to use it true bypass don't have to bother with the extra components or board size. 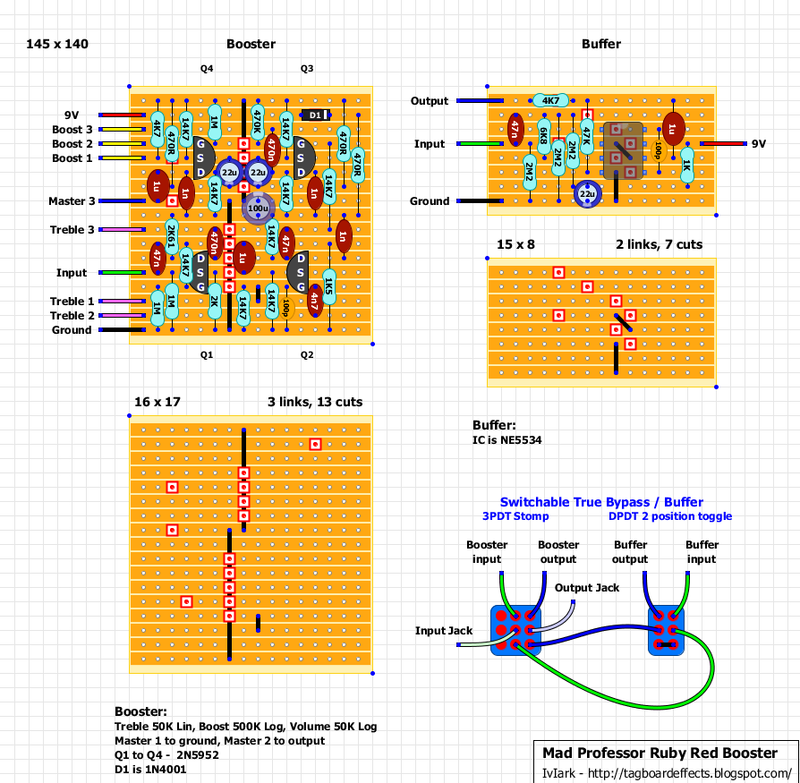 Mad Professor Ruby Red Booster (RRB) is a combination of two boosters and a switchable buffer. The two boosters are based on the much sought after BJF Little Red Trebler and Red Rooster Booster, connected in that order and with a master volume control. The RRB can be used as a treble booster, a clean boost or an overdrive unit or any combination of the above. Inside the pedal there is a switch for a high quality buffer. You can set the pedal for true bypass mode or "buffer on" in bypass mode. The Treble Booster is a fine-tuned booster for just the right treble frequency with carefully designed bandwidth and an optimized slope of bass cut. The booster circuit is designed to overdrive the amplifier inputs from nice shimmer to heavy overdrive, thanks to the massive 40dB of boost. The booster is tuned so that it produces musical distortion by itself on higher boost settings. The easy to use Mad Professor Ruby Red Booster must be the most versatile high quality booster on market. Build the Mad Professor way: small footprint and big tone. Had a little head to head time with this today. Fet images are in 180 degress, but pinout is right. I'm up to the point where i get sweet sounds when probing Q3 gate and source, but then something happens... Might be my mistake too, so i'm going to continue this tomorrow. But since this is unverified, i thought i'd ask if you have time to check out if everything is right around Q4..
and that all looks right to me. You haven't used a 470K instead of 470R have you? Found it. My bad. Both positive leads of 22u's were one strip lower than they should be. Boost 3 and 1 are in reverse. Otherwise the boost part is verified. Now i need to swap the led that i burned during careless troubleshooting. But that can wait till tomorrow. Same as testing this through.. Excellent, I've updated the layout but let me know how you get on tomorrow. Very discreet and beautiful sound. Only other boost i have at hand is SHO, and if compared, this one is sleeky clean, except when treble is maxed. Even then the sound stays well together. It's a real possibility that i will probably replace my SHO clone with this on my main setup. It doesn't seem to give out as much power as SHO, but it's cleanliness is remarkable. I get some noise when boost is maxed, but nothing serious. Only thing that puzzles me is something that is probably in the design. Master is just to attenuate the signal. If treble and boost are at 0, then the master does nothing. It's good sounding clean boost/treble boost. I'm still yet try it high volumes, but here at home it gives out at least enough. That sounds strange about the Master Volume. It's a standard volume control and so in the counter clockwise position connects the output to ground. So it should be silent irrespective of the other settings. Sounds like there may be a bad joint on a ground connection somewhere. I'll go through it again, but.. It sounds good the way it is and though the controls are what they are, the sound is compareable to proguitarshop demo. I'll take this under magnifying glass tomorrow. Went it literally through with magnifying glass and got the controls back. Some bridge and/or bad joint. Once again, i should always be more thorough the first time. Would mean less fixing afterwards. It isn't that subtle anymore.. :) Which is not a bad thing. There's warm and big sounding overdrive when cranked to the max. Hi i ve built just the booster layout only three times alrdy but still not working. Ive checked everythings according to layout. Jfets are corrctly oriented so do caps. What voltages are you getting between all the transistor pins and ground? hi everyone i solve my issues. i just nd to turn my jfet over, haha. just checked at the datasheet. here are my reading. drain voltage on all jfets is 7.01v ish. Gate are all measured 0v. And Source for Q2&Q4 is 1.88v while Q1&Q3 is 1.455 ish..
Is this a good reading? can it be improved? Is it recommended to pair the JFETs? Or buy them paired as mirosol did? I just finished building this one. The FET's should be 180 degrees rotated but with the same pin out. Also the boost 1 and 3 should be swaped! For the rest... sweeeeeeeeeeeeet. Thanks for the heads up Arnold, can't believe these corrections have passed me by for so long! What other buffer IC's can I use that are equivalent that I could source from Mammoth? They don't carry the NE5535. Whoa, just in time. Almost submitted my order without it. Thanks! I really like the switching on this. I want the buffer to use a toggle and the boost to use a 3PDT switch and I would like both effects to have their own LED indicator. The layout above doesn't say anything about where LEDs would go and the switching doesn't follow the traditional off-board wiring laid out o the site. Can you guys help me figure out how to do this? Use the unused left hand pole of the Boost switch for the Boost LED. Instead of a DPDT switch shown, also use a 3PDT switch for the Buffer and again use the third pole for LED switching. Will this work with 18v? (All the caps are rated from 25v and up). Will it do any good? I'm leaving this comment so I remember. "2N5485 is the closest US type."